Featured performers are The Chris Carlson Quintet (with friends) and Michelle Alany & the Mystics. Karissa Lowe will be our Master of Ceremonies. The event is slated for May 25th, 8:00 PM to 11:00 PM at Mississippi Pizza Pub & Atlantis Lounge, 3552 N. Mississippi Ave., Portland, OR 97227. 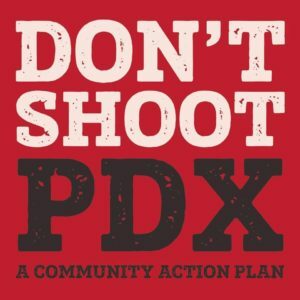 Teressa Raiford, founder of Don’t Shoot Portland, will be on hand to talk about the important work her organization is doing, and to meet directly with attendees. Admission is $10, with 100% of proceeds going to benefit Don’t Shoot Don’t Shoot Portland. Since 2014, we have seen a rising of activists, family members and concerned citizens across the country coming together in the name of community outreach in an effort to create solutions for the current issues our world faces today. Connecting through grassroots events have helped many to shape tools for accessing a voice in community outreach with political power and influence, these including non-violent direct action and protest. Our regional and demographic relativity to the experiences in our community have forced us to unite as activists and social advocates for youth, families and vulnerable community members. Our organizational work and activism, including direct community education workshops, support the outreach of our continued advocacy as first respondents and has helped community members contribute through direct engagement and legislative value. There are a vast amount of policy based assets influenced and being harnessed in our strategic building of relationships and networks used toward the shift in culture and systemic discrimination. Activists from the front line need to be encouraged to continue frank and honest conversations about our connection with Ferguson and Race in America and its influence within politics. 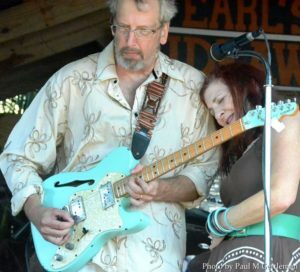 Legendary blues performers and beloved long-time Portland residents Chris Carlson and wife Duffy Bishop moved to St. Augustine, Florida a while back, but they’ve never lost their connection with Portland and it’s musical community. They’re back in town for a few west coast gigs, and while they’re here have graciously (and enthusiastically) agreed to Support While Rome Burns’ last Thursday event in May. Carlson is taking the opportunity to reignite his old band, The Chris Carlson Quintet. Once a staple of the local blues scene, the quintet (well, sometimes it was a quartet – but who’s counting?) was always a sure bet for a top-notch blues-infused night on the town. The current version of the band will include an all-star lineup: Dave Kahl on bass, Fred Ingram on drums, and Brad Ulrich on saxophone*. This gig is a must see if you’re a fan the blues – and even if you’re not. Because – trust me on this – you WILL be a fan by about the middle of the first song. With writing partner Carl Sander, Chris co-wrote the legendary “The String Cycle: A Tavern Opera With Guitar Outlaws” which gave birth to “Its A Guitar Outlaw Christmas Chorale” entertaining dozens for over 25 years (and counting) at Seattle’s Fabulous Eastlake Zoo Tavern. Journey through exotic lands with this fiddle-driven caravan of Jazz Manouche, Balkan, Klezmer, Sephardic & original soul music, spiked with a Texas fiddle twist. Really. Michelle Alany & the Mysics music is captivating, in no small part due to Michelle Alany herself. It’s impossible to look away when Michelle steps up to coax a 500-year old tune from her violin, to make it her own, and then to cast it upon the audience like so much fairy dust. Oh, and she sings, too. Boy, can she sing. Resistance is futile, truly. 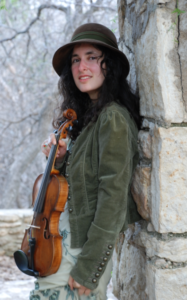 Fresh off a tour in Spain, bandleader, violinist & vocalist Michelle Alany is back to bouncing around the US, playing dates in Texas, Alaska, New Mexico and on and on. She’s becoming something of a Portland regular, popping in every now and then to juice up the local world music scene a wee bit. While Rome Burns is most fortunate that her busy tour schedule matched up with our May benefit event for Don’t Shoot Portland – we are pleased and honored to include her soulful, positive and timeless presence in service to the cause. WHILE ROME BURNS is a group of Portland-area musicians formed in response to recent social and political trends. Our mission is to leverage the power of music and community to support and affirm diversity and social justice in our neighborhoods, our communities and our world. We donate our time and craft through an ongoing series of events, providing music and a forum for various projects and organizations that support tolerance – religious, ethnic, gender and sexual orientation/identity – and advocate the celebration of our differences. We reject the politics of exclusion and believe that sharing through music and community is a path to a richer, more empathetic world.